The uniqueness of "Karapan Sapi" (english: bull race) is the interesting one for the most tourists when they come to Madura island. This festival can't be found in other places in Indonesia even in the world. The excitement of this festival is so amazing when the race accompanied by traditional Gamelan named "saronen" and also the audience shouts, which is encouraging the cows where they're racing quickly. Karapan sapi is a race for a couple of bulls ridden by jockey called "tukang tongko". The rider stand on what so-called "kaleles", which then drawn by the bulls. The jockey stand to control the bulls at high speed along the 100 meters of race track for 10 seconds to 1 minute. Karapan Sapi isn't just an ordinary cow race. A team made to set strategies and tactics. The team consists of : "tukang tongko" the cow rider ; tukang tambeng, which holds the cows before being released ; tukang gettak which spurs the cows in order to run faster and straight ; tukang tonja, which leads the cows to obey to their trainer ; tukang gubra, the supporters who support by their whoop to encourage the cows from the edge of the field. Before the race started, a pair of bulls will walk around the field race accompanied by traditional music, Saronen. Saronen are music and dance which accompany a pair of cows before they race in the race. The sounds are dominated by trumpet and series of unique gongs, which is played by a group of men with colorful costumes typical of Madura. All bulls will be herded into the race field before the race started, those bulls will surround the field while they use unique costumes and unique accessories on their necks so the people will know the differences. After the parade ends, costumes and accessories will be released from the bulls. Only accessories which aren't harming the bull's movement still placed and not released. The bulls which are contested, previously drink intoxicating drinks (Indonesian: arak) and then they're released into the race field. Arak used to make the bulls run faster than usual. The fastest time which has been recorded is about nine seconds for the distance more than 100 meters. The bulls which are contested are selected bulls and usually the price is so expensive, around hundreds million rupiah. The bull race is held in various places in Madura on the end of July until October. This race is started at the sub-district and regency levels and the final race is national bull race or we call it "Gubeng" held on the end of September or October in Pamekasan and compete for President's Cup. When the final race comes, around 100 bulls will surround the city with complete costumes and unique accessories and the people also the tourists are willing by waiting for their comings though the weather is dry or rainy. When the race held, the race divided into 3 round matches. The first round is about determining the winner group and the loser group. The second round is about determining the winner of the loser group. The last round is about determining the winner of the winner group. The President's Cup is given only for the winner from the winner group. The origin of Karapan Sapi according to folklore of Madura is started by a muslim scholar named Syeikh Ahmad Baidawi, which was known as Prince Katandur, the son of Prince Pakaos, grandson of Sunan Kudus. In addition to spread Islam, Prince Katandur also expert in planting, farming, and gardening. 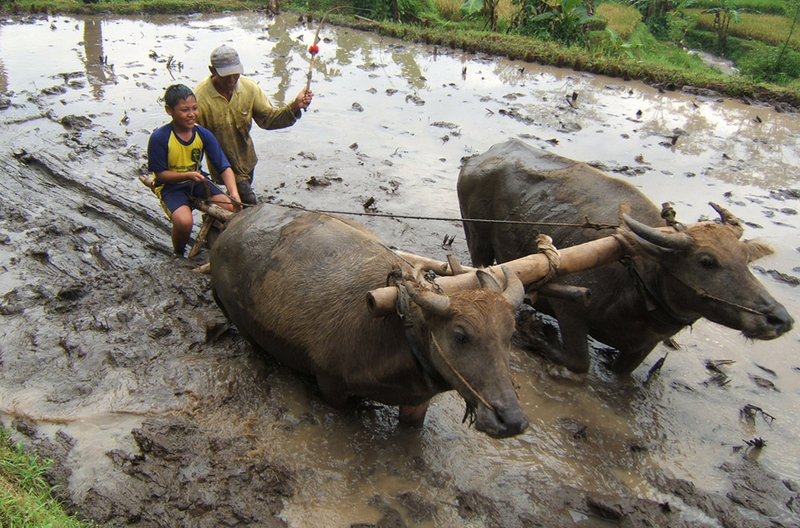 He taught the local people how to plow the ground (rice field) which called as "nanggala" or "salaga" where use two bamboos drawn by two cows. Gradually, many farmers used cows to plow their rice field and at the same time, the farmers made a competition. The competition was about who will finish in plowing the rice field faster. In the end, the competition turned into a kind of racing sport with two bulls called Karapan Sapi. Madura Island is located in the offshore of East Java, exactly in the north east of East Java. You can visit it through Suramadu Bridge or by using ferry ship for 1,5 hours. Also, you can use public transportation or rental cars or even motorcycle from Surabaya to visit Madura. Be careful of strong winds which come from the left or right side of Suramadu Bridge. It's better if you don't use motorcycle for your safety. If you can't, you can ask the bridge officer there about how the weather is or how the wind speed is. They will allow you to go through the bridge if the weather or the wind speed is normal. Please ride your motorcycle slowly while you cross the bridge. Sometimes strong winds come suddenly from the left or right side of the bridge.